3 – 4 Clinton Anderson, Stacy Westfall and Chris Cox face off in a three hour colt-starting challenge during Road to the Horse. Murfreesboro, Tenn.; www.roadtothehorse.com. 9 – 10 The Equine Hoof Care and Shoeing Short Course offers a combination of lecture and applied learning in care and management. 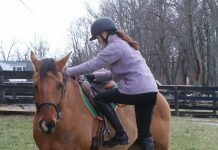 Raleigh, N.C.; Extension Horse Husbandry, (919) 515-5784.